more compensation. That’s our specialty. 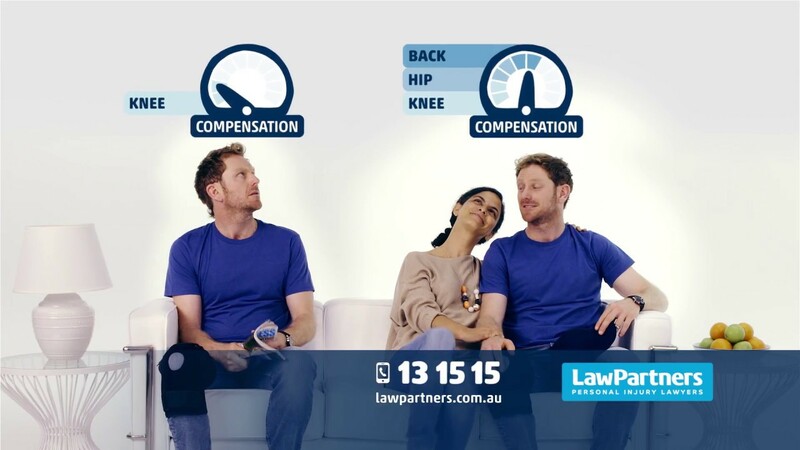 Law Partners is Australia’s largest specialist personal injury firm. We ask more questions and get to know you personally, so you’ll get more compensation. It costs nothing to speak to one of our lawyers and start your claim today. We can help you claim compensation. We can help ease the financial stress. There's no cost to speak to a specialist. Our no win no fee guarantee means you won’t be required to pay any fees to us until we win your case. We specialise in injury compensation and win over 99% of our cases. There’s no cost to speak to one of our specialist injury lawyers and find out where you stand. We’ll cover all the costs to prepare and run your case, so you’ll never be out of pocket. “ I just wanted to say thank you for everything Law Partners have done for my family and I over the last 18 or so months. Thank you so much for handling our case with the utmost professionalism and thank you for always being just a phone call or email away to answer our questions and give us a great result. ” Lee G.
“ I would just like to take this opportunity to thank Law Partners for their services. The outcome was excellent and right from the first meeting to the last, Law Partners made the whole process feel seamless and effortless! I was pretty uncertain at first choosing a lawyer but so glad I chose Law Partners. ” Shani D.
“ Thank you and all your staff for the help you have provided in these trying times. I was feeling pretty negative about my future but after my first meeting with my lawyer I knew I had someone on my side who really wanted to help me. I wouldn’t hesitate recommending you to anyone who needs your services. ” Cem O. “ I would like to take this opportunity to express my gratitude to my solicitor and the other Law Partners’ staff who assisted my children and myself since our car accident in 2012. I am certain that any positive and useful result would not have been achieved without your efforts, assistance and dedication to our cases. ” Kylie J. “ After an injury that totally removed me from the workforce my future was bleak. I approached several Law companies receiving very little guidance, then I found Law Partners. With my settlement I keep my home and possessions and family intact. I also have good friends for life in the team at Law Partners. ” Derek H.
“ I came to Law Partners to pursue a compensation claim and I found their delivery of service excellent and efficient. They constantly kept me up to date with the progress of my claim. I couldn't imagine finding a better solicitor to handle my claim. ” Janette C.
“ I came to Law Partners because they specialise in compensation. My lawyer made me feel very comfortable and gave fantastic advice. I am 110% satisfied with the result, I got a better result than expected after following my lawyer's advice. I would have no hesitation in recommending Law Partners to others. ” Marseill W.
“ ​Thank you for the final paperwork and the transfer of funds into my account. After my car accident I was advised by my grandson’s girlfriend who is a solicitor, to get the services of a compensation law firm. We wouldn't hesitate in recommending your company to anyone who might need a law firm in the future. ” D Barnes. If you’ve been injured in an accident and incurred any treatment costs or had any time off work to recover, you’re more than likely to be eligible to claim compensation. There’s one factor that will ultimately determine how much compensation you receive – and that’s how well your lawyer gets to know you personally. At first glance the consequences of your injuries might seem obvious. But our lawyers will take the time to find out more about you, your family and what your life was like before you were injured. Many of our clients’ injuries have led to other complications and health issues. It’s only through taking the time to understand your situation that a lawyer can successfully claim all the compensation you’re entitled to and deserve. You can lodge your own compensation claim without using a law firm. However, the amount of compensation you receive will depend on the evidence you provide to support your claim. We’ll provide you with a personal injury lawyer who specialises in your claim type, to investigate your claim thoroughly and build a strong case to claim your full entitlements. Law Partners’ no win, no fee guarantee means you won’t be required to pay any professional fees, disbursements or barrister’s costs to our firm if your claim for personal injury compensation is unsuccessful. It’s a risk free way to pursue your claim. We also put a cap on our fees, so there are no nasty surprises at the end of your successful claim. We believe you should feel comfortable that you can speak to your solicitor at any time, without worrying about the cost getting out of control. Find your closest Law Partners office. Empathy is more than just feeling sorry for someone. Join Choose Empathy ambassador Michael Clarke as he hosts a series of stories about sections of our community that are largely misunderstood, and see how Choosing Empathy can make Australia a better place for all of us.